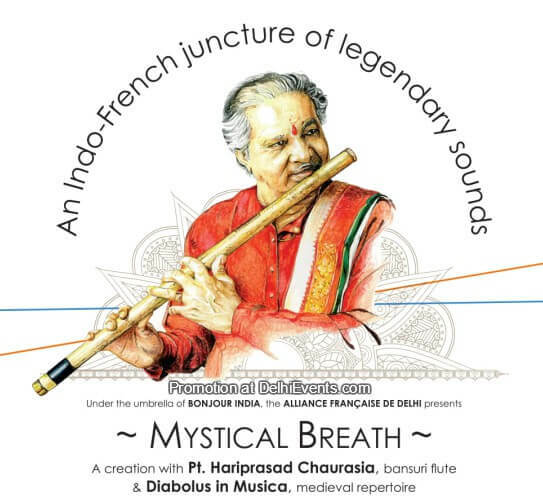 Following the launch of Bonjour India - incubating dreams, ideas and projects which aim to move the partnership between India and France into the future, Pondicherry saw the launch of Mystical Breath, a performance by Hariprasad Chaurasia, India’s greatest flute player, with the renowned French vocal ensemble Diabolus in Musica. Hariprasad Chaurasia's immense talent as a composer allows him to capture the essence of the major genres of music from all continents. Today, he is confronting the source of all Western classical music: the plainchant evolved in Christian communities of Western Europe during the first centuries in the form of Gregorian chant and the first polyphonies of the Ecole de Notre-Dame, of which the Ensemble Diabolus in Musica has become an iconic and award winning interpreter. The long bamboo flute, incarnation of the breath, is the ideal instrument for this unprecedented meeting between two worlds. 'Mystical Breath' explores common fundamentals of these two repertoires: modality, improvisation on a content, virtuosity, rhythmic freedom or constraint, human breathing in the service of the music and the divine breath. The ecstasy of the subtle bansuri flute meets the vibratory power of Diabolus in Musica&#39;s terrestrial voices in a unique and exhilarating experience. Dr. Bertrand de Hartingh, General Curator of Bonjour India, Counsellor for Cooperation and Cultural Affairs, spoke about Mystical Breath: “Bonjour India’s latest edition puts the emphasis on long-term partnerships that allow respectful and mutual enrichment of two traditions. Through this collaboration of diverse musical performances we hope to inspire long-term partnerships and awareness about various verticals of music. We are honoured to bring this innovative partnership to India and share it with the Indian audience.